This is a low-level palletizer and used to stack various packs including sealed cartons in order on a pallet. It is an ideal palletizer for shrinkable film wrapped spring bottles. 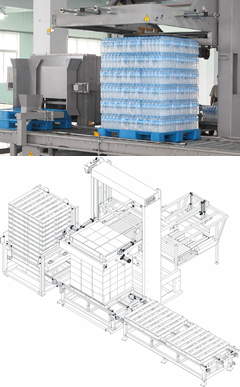 It works automatically and packs can be stacked on a pallet by multiple layers. It employs a touch screen PLC controller and is easy to operate. Sort packs according to a set pattern and then convey them. Catch sorted packs and then rise, move and put them on a pallet. 5-8 empty pallets can be stacked in the storage section. Pallets are fed to the palletizer according to the PLC setting. When a pallet is loaded fully, it will be delivered to a designated location.